An engineering professor warned in 2016 that the so-called Morandi bridge near Genoa, which collapsed on Tuesday, needed to be completely rebuilt as its structure had deteriorated too rapidly. Constructed in the 1960s, the motorway bridge underwent extensive repairs in the 1980s, 1990s and most recently in 2016. Work on its foundations was being carried out at the time of its collapse. "The continuous costs for its maintenance suggest that in a few years, these costs will exceed the costs of reconstruction of the bridge: at that point it will be the time to demolish it and rebuild it," Antonio Brencich, a professor of engineering at the University of Genoa told industry magazine ingengneri.info two years ago. In an interview today with Radio Capital he confirmed his impression that structure was fundamentally unsound. While such a bridge should last at least 100 years, he observed that “one of the towers, the east one had to be reinforced in a very significant way with a substitution of key components, only 20 years after its construction: 20 years for a bridge is nothing." The west tower of the 1.1km long bridge tumbled to the ground with as many as 35 vehicles driving on it. Rescuers in Genoa continued their search throughout the night for any survivors. The ANSA news agency has reported the death toll could reach around 39, citing fire brigade sources. Luigi D'Angelo, a senior official at the civil protection agency, told reporters that the authorities did not have enough information to understand how the incident occurred. "There were no signs of danger. The bridge is subject to frequent checks, it was a constantly-monitored infrastructure. The works in progress were just ordinary maintenance." The engineer who built the bridge, Riccardo Morandi was known for his innovative use of reinforced concrete. He was also behind the construction of Maracaibo bay bridge in Venezuela, which partially collapsed after being hit by a petrol tanker in 1964, two years after its completion. Morandi, who also contributed to the construction bridges in Florence and near Rome’s Fiumicino Airport, took his own life on Christmas Day 1989. 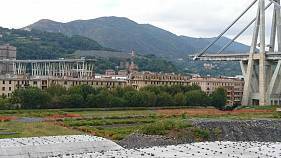 Genoese architect Diego Zoppi, former president of the Genoese Order, told the ANSA news agency that the bridge was flawed in its construction. Another issue raised about the bridge was the weight of traffic passing through it, as it is the main artery linking southwest France and northwest Italy with the heart of the country. "When it was built, it was not built to sustain the traffic of such heavy vehicles," former Genoa city councillor Gianni Vassallo noted in a 2014 local TV interview. In 2013, a local committee of the Five Star Movement, now a party in the ruling coalition, dismissed warnings about the bridge's safety: "We are cyclically told the fairy tale of the collapse of the Morandi bridge," the committee wrote. The now ruling Five Star Movement has been known to be critical of large infrastructure projects including being against a proposed train line between Lyon, France, and Turin, Italy.